The overall robustness of the Zaturn mist blower is based on Hardi’s many years of experience in orchard spraying. 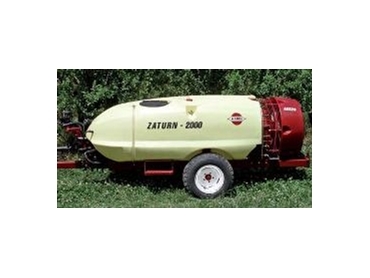 The Zaturn mist blower is suited for a wide range of crops, from small bushes to large trees. The user friendly design enables fast and efficient setup in any orchard. This is a power full and economical mist blower which will suit most orchards. Polyethylene tank: Smooth surface and rounded corners enables and optimizes the performance of the agitation system as well as easing the tasks of cleaning. All sprayers are fitted with clean water tank and as an option, a rinsing tank is offered. Air kits: The compact AG750 air kit is ideal for narrow orchards, while the larger AG820 fan, with its turbo channel, provides an outstanding air distribution which is ideal for denser and higher trees. Hardi diaphragm pump: Economic maintenance, easy to operate. Self priming without risk of damage if it runs dry. Duo deflector: The AG 820 is available with special deflectors for vine or fruit trees. The deflectors provide an optimized application and minimize the drift.